One of the most flexible ways to earn money from home is by working for the variety of freelance sites online. Filtering through the variety of websites and jobs online can be overwhelming so we wanted to share our list of the best freelance jobs online for beginners. These websites offer a wide variety of work from home tasks from admin tasks to writing to IT, if you have a skill you can probably turn it into a freelancing gig. What Do These Freelance Jobs Online For Beginners Entail? Really these freelance job sites offer a wide variety of freelance jobs online for beginners. If you have a very specific work background and are looking for a website that offers freelance gigs specific to your skills you can still use the list below but might be better off using a freelance site for your specific type of jobs. For example if you have a skills as a writer check out the wide variety of freelance writing websites for work at home writers in order to find freelancing jobs. Those with past experience in art or illustration have a variety of freelance art jobs to choose from. If your skills are not as specific or if you are not really sure yet exactly what kind of freelance work you want to be doing then these general freelance jobs online for beginners are a better place to start your job search. Generally these websites work pretty similarly. After setting up a profile on the freelancing site you can then search the available jobs. When you find one that would be a good match for your skills you submit an application and can then be interviewed for the job and hired. There are no requirements or fees for setting up a profile or applying to jobs. Most of these freelance sites take out a fee once you start working based on how much you earn on each project. For example Upwork charges the following fees that are taken out of your payment. This is just an example so be sure to check each website for their specific fees before getting started. Some freelancers find they really prefer the types of jobs or the types of clients the different freelance sites offer so once you get started you may find you have a favorite site to work with. Probably the most difficult thing about getting freelance jobs online for beginners is getting those first few assignments. With most of these sites as you work with clients they will provide feedback on your quality of work and your profile can show how many assignments you have successfully completed or ratings on previous work. Obviously in most cases once you have completed some quality work and have proven to be a quality freelancer to work with, more people will want to work with you. What Will My Hours and Pay Be? The great thing about doing freelance work is that you can apply to and work only the jobs that you want to do. This means you can really work as little or as much as you want and make your own hours. When you accept a job the pay should be clearly stated. Sometimes this might be an hourly wage or sometimes it might be a fixed price for a project. If you take a job with a fixed price be sure you have a good understanding of how long the project will take you so you know if it is worth your time. All invoices and payments are made through the freelancing website so you don’t have to worry about bugging clients to get paid. The more work you do and the more experience you get the better your profile will look and the more jobs you will get. Make sure when you accept a project you follow through on time and with high quality work so that you receive good feedback from the clients you work with in order to get hired for more jobs in the future. You can get started right away by signing up for each of the freelancing sites, setting up a profile, and searching for jobs. 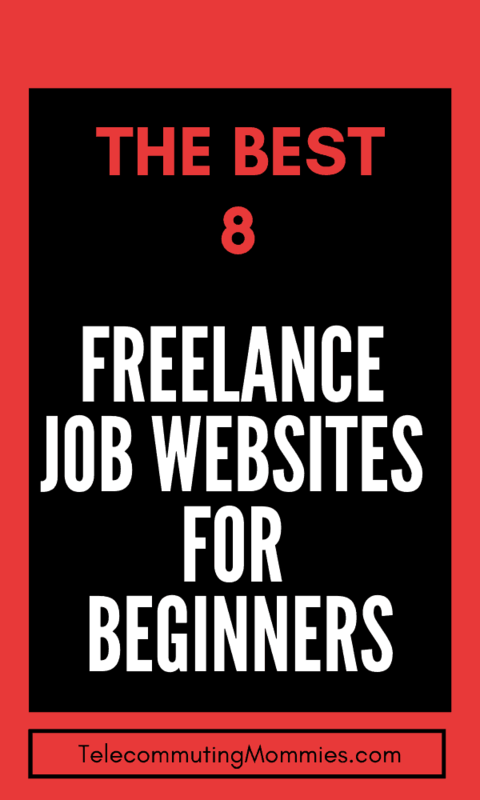 Here are the websites we recommend for freelance jobs online for beginners. The convenience of freelance work makes it a great fit for stay at home moms or dads, students, or those looking to generate a second income in their free time. It might take a little time to grow your profile and find the types of jobs that are a good fit for your skill set and that you enjoy doing but generating income as a freelancer can make it well worth your time.